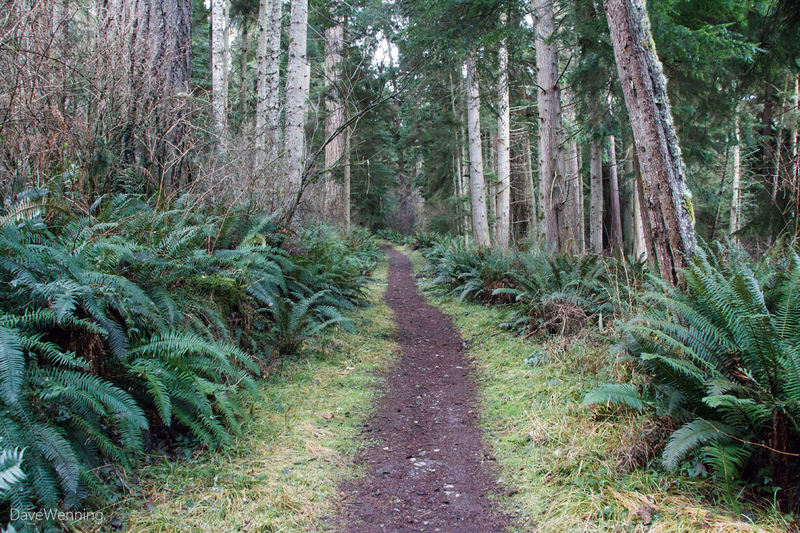 The other day I took my first hike out to Hoypus Point in Deception Pass State Park. I wanted to get my bearings for the upcoming First Day Hike for 2016. As I mentioned, I had never explored this section of the park. Since then, the skies have cleared and the temperatures have dropped. With a day off work and and perfect weather, I decided to return to Hoypus and explore a little more territory. I arrived about 8:30 a.m. The temperature was 30° F (-1° C) with clear skies and a rising sun. 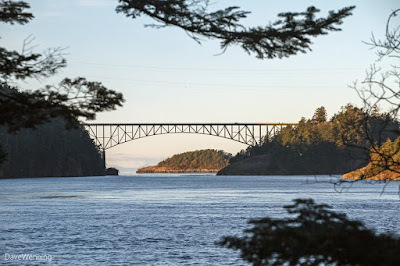 How different the Deception Pass Bridge looks today with the morning sun just starting to hit it. Today, I planned to explore the CCC Crossing Trail which would take me deeper into the Hoypus forest. From the Cornet Bay Road Trail I took the first right and found a gently rising slope into the woods. I noticed the trails had been freshly groomed, no doubt by the guys from SWITMO. Is this an indication it will be part of the itinerary for the First Day Hike on New Year's Day? 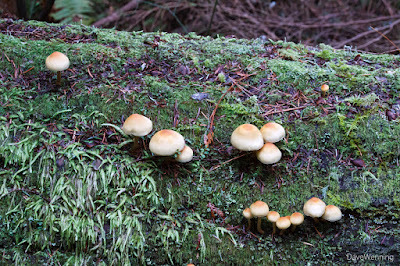 The junction to the CCC Crossing was clearly marked. 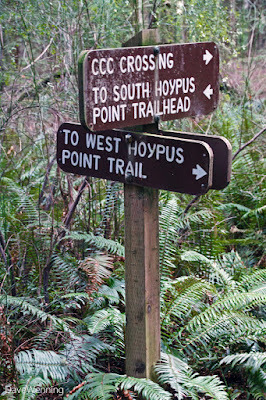 Next time I want to follow that West Hoypus Trail and hike the complete loop around the point. The name "CCC Crossing" remembers the men of the Civilian Conservation Corps who built this park in the 1930's. 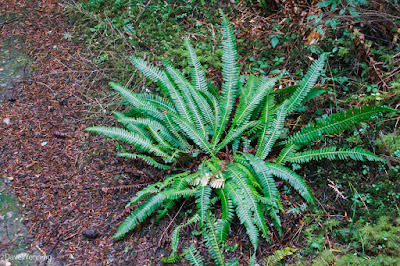 I found several clusters of Deer Ferns along the CCC Crossing. 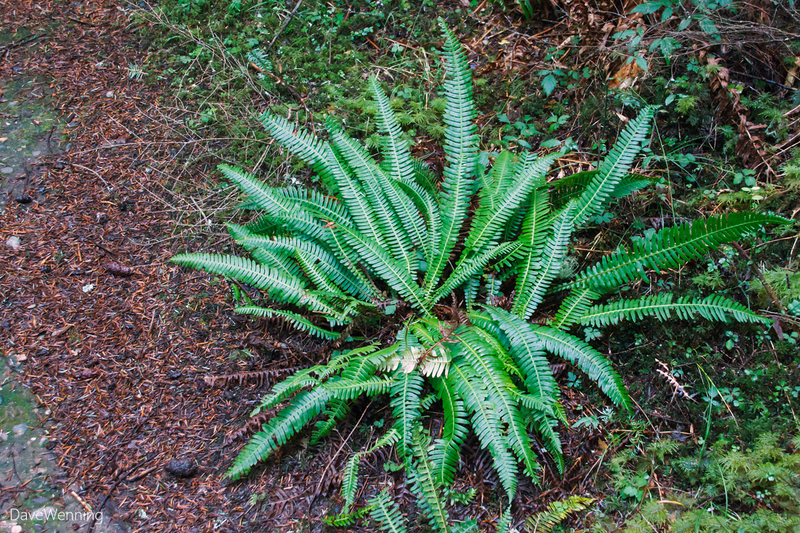 It is a less common fern than our ubiquitous Western Sword Ferns. It prefers moister conditions, so that might reveal something about spots where they are growing. The CCC Crossing is in deep woods and it was quite dark. This really tested the limits of my camera. The fern was shot at ISO 3200, f/8, at 1/6 second and I was certain it would end up dark, blurry and not usable. The editing software kept trying to over-brighten them. I had to crank back the brightness and highlights to make them look more like what I saw. It looks like the whole family has gathered for the holidays. In the lower left is a peculiar moss, or perhaps a liverwort, that I have never seen before. I didn't find it in my Pojar. This was another challenging photo for bad lighting. I spotted several nurse logs (or in this case a nurse stump) which is an important botanical feature in the Pacific Northwest. 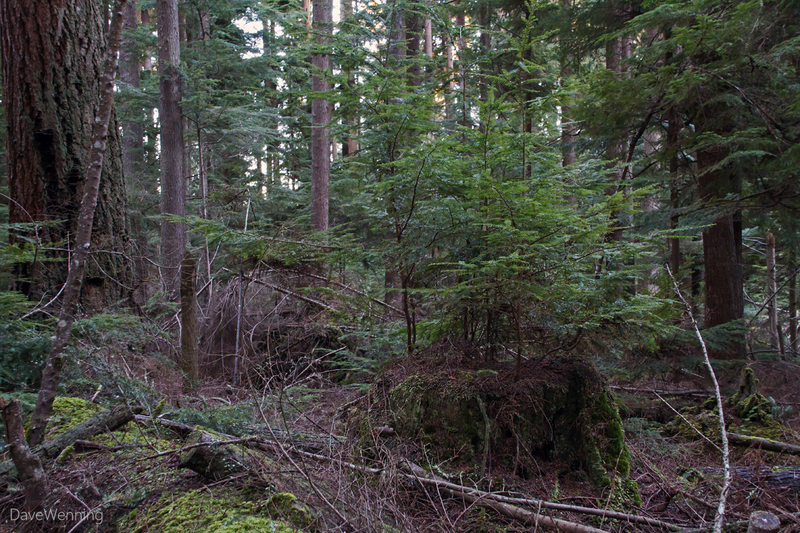 Western Hemlock, seen in the photo, relies on nurse logs for its propagation. 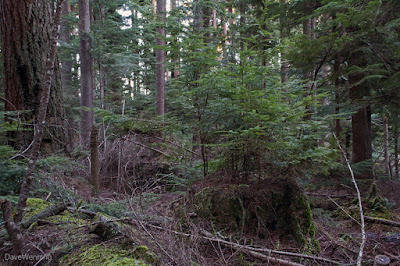 I have also seen Pacific Rhododendrons, Red Huckleberry, Salal and Thimbleberry growing from old fallen trees and stumps. 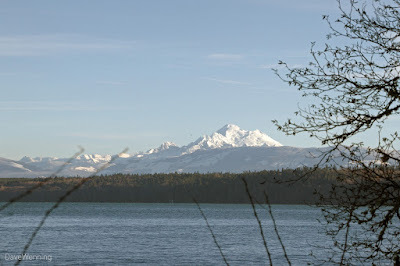 When I completed the loop back to Cornet Bay Road, I was startled by the sight of Mount Baker in the morning sun. She was completely obscured by the heavy overcast on my first visit last weekend. 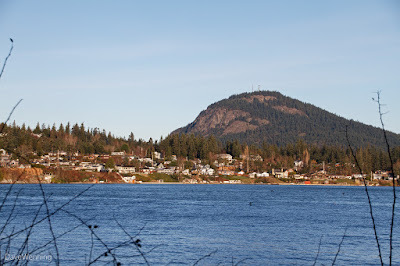 At the end of Cornet Bay Road, once again, is Mount Erie and Dewey Beach on Fidalgo Island. They also looked very different in the bright sun. I am looking forward to my fifth First Day Hike in Deception Pass State Park on New Year's Day. This year we will explore Hoypus Point, but the exact route will be a surprise. If you like what you have seen in these posts, come and join the party. The Park Manager and naturalist guides will be there to answer questions. 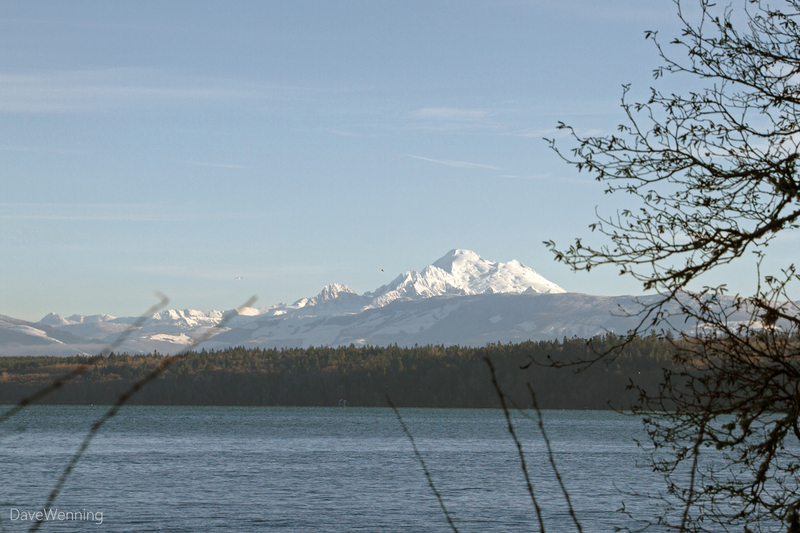 Meet at the State Park docks on Cornet Bay at 10:00 a.m. From State Road 20 on Whidbey Island turn onto Cornet Bay Road and follow it to the end. Plan on sunshine and 34°, so dress warmly and bring your camera.